How green can we be? A Canadian dentistry professor designed a solar-powered brush that works without paste! It uses electrons instead which might soon make tooth paste a thing of the past! The electrons help clean the teeth and kill bacteria. 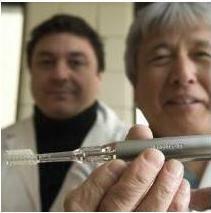 Dentistry professor Kunio Komiyama and Gerry Uswak, the dean of the University of Saskatchewan College of Dentistry have worked with a Japanese manufacturer Shiken to create the solar toothbrush. Called Soladey-J3X has a small solar panel at the end of the tip. 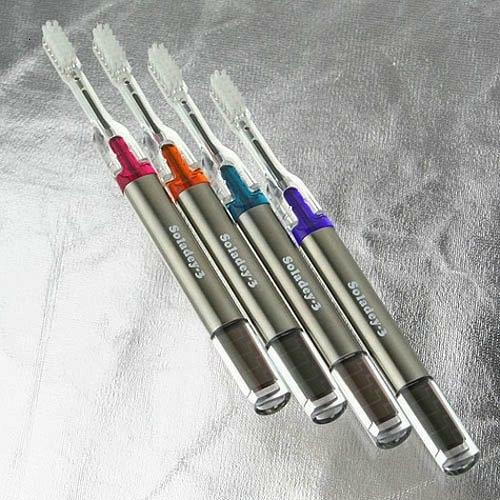 When a small amount of light hits the brush it transmits electrons to the bristles. Those electrons reach with saliva in the mouth causing plaque to break down and also kill bacteria responsible for periodontal disease. The professors are testing the brush on 120 teenagers and compare those results to a normal tooth brush with paste. Previous US Concerned over Chinese Made Phones!? Next Gmail VoIP Feature Coming Soon – Updated! I WANT 10 PIES, HOW CAN I BUY ?